A fun, family-friendly tradition in Hendricks County is back! The Scarecrow Display around the historic Hendricks County Courthouse Square in Danville welcomes fall in a bright, festive manner as local businesses show off their creativity during the month of October with unique hand-made scarecrows that go all the way around the Courthouse. Each year, the Downtown Danville Partnership hosts the Scarecrow Display and brings in a special panel of judges to determine the best scarecrow in the land. This year&apos;s judges -- which included Nina Criscuolo from WISH-TV and Hendricks Circuit Court Judge Dan Zielinski (who better to judge than an actual judge, right??) -- selected the winner on Sept. 30. Congratulations to Caskey Affordable Dental Services! You&apos;ll definitely want to check out their tooth fairy scarecrow! But judging is such a subjective process, isn&apos;t it? Maybe the panel&apos;s choice isn&apos;t my choice. So I went to check them out for myself. 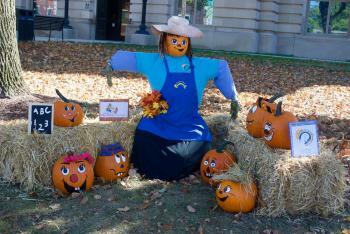 You can explore the Scarecrow Display all day any day during the month of October, and it&apos;s free of charge, so I chose one of the gorgeous weekend days we just had and took a stroll around the Courthouse Square to decide for myself which scarecrow I like best. Right off the bat, I spotted a photo opportunity with the display set up by Seize the Night Designs. Seize the Night Designs is right across the street from the Scarecrow Display, on the south side of the Courthouse Square, and it&apos;s a popular place to shop for hand-made jewelry and other unique gifts. Their scarecrow is actually a photo board decorated with Jack from "The Nightmare Before Christmas" movie. Have your kids pop their heads into one of the pumpkins in Jack&apos;s hands, and you&apos;ve got yourself a cute photo. There are a lot of excellent scarecrows all around the Square, and one that particularly caught my eye was designed by Smokey Fireside Creations. 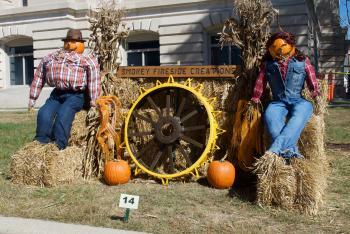 Located on the west side of the Courthouse Square, Smokey Fireside Creations offers handmade crafts, home decor and other small town trinkets. 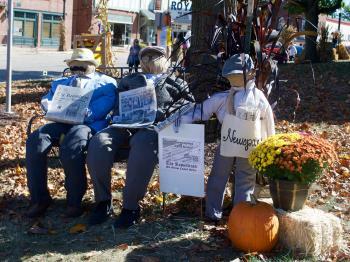 There&apos;s just something about the wagon wheel sun in their scarecrow display that spoke "autumn" to me. It&apos;s a display feature that I haven&apos;t seen before. I really enjoy the cheerful yellow and the creative design of their entire display. Another favorite of mine is the scarecrow created by Sonshine School -- a pre-school and daycare based out of Northview Christian Church in Danville. The bright white eyes and teeth on their jack o&apos; lanterns are super cute. I also enjoyed the "people" sitting on a bench with copies of The Republican -- a local newspaper -- in a display that was created, of course, by The Republican. I thought it was a nice touch to include their feature article on last year&apos;s Scarecrow Display in their entry this year. I also like the old-time paperboy. Beasley&apos;s Orchard in Danville has a fun "Despicable Me"-themed display that highlights their Minions Corn Maze that just opened. Their scarecrow has Gru taking Kevin, Bob and Stuart on a hayride -- another activity that families can enjoy at Beasley&apos;s Orchard this fall -- surrounded by lots of colorful pumpkins and gourds. To learn more about the Minion Corn Maze at Beasley&apos;s Orchard, click here. Ultimately, however, Hackleman Auto Collision Repair created my favorite scarecrow. I will admit that I&apos;m terribly biased because of the tremendous job they&apos;ve done over the years putting my vehicles back together after a variety of mishaps on my part. I&apos;ve always loved Hackleman&apos;s creative use of items from their shop. This year, they also chose a Minions theme -- no doubt, to further advertise the popular Minion Corn Maze at Beasley&apos;s Orchard -- and they created their Minions using 50-gallon barrels for bodies, brake rotors for goggles, seatbelts for goggle straps, and what I suspect are exhaust pipes for arms. The coconut bikini top, the grass skirt and the skeleton flamingo pushed their display up to the top of my list. This year&apos;s Scarecrow Display includes dozens of additional scarecrows to see around the Courthouse Square, so make sure you come to Danville sometime during the month of October to check them out. 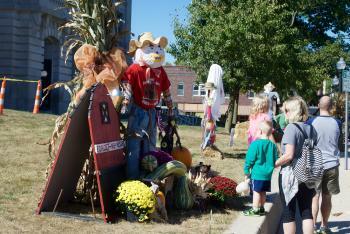 Will the Caskey Dental tooth fairy scarecrow display be your favorite? 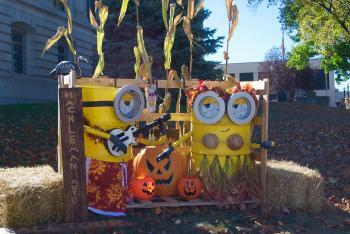 How about the Hackleman Auto Collision Repair Minion scarecrows? Or perhaps something else entirely? There&apos;s only one way to find out. After you&apos;ve looked at all of the wonderful scarecrows on display, comment below and let us know which one is your favorite! I can&apos;t wait to see your choice!